It is the best knife Colyn has ever seen. He finds it by chance, buried in the potato paddock where he is working with his father, and immediately he knows that he has wanted a knife of his own for a long time. It is special. It is his knife. But is it really chance that has led him to its discovery? Colyn soon learns that there is not only beauty in the knife, but magic, too; and with the magic come power and danger. For, with his knife, Colyn opens a doorway into a mysterious otherworld, and here he becomes involved in an adventure more exciting and more perilous than he could ever have imagined. 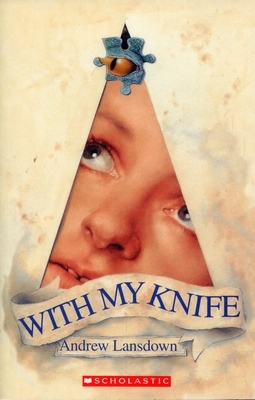 With My Knife was shortlisted in 1994 for both the National Children’s Book Award and the Western Australian Young Readers’ Book Award. The first edition of With My Knife had four print runs — 1992 (2x), 1994 and 1996. The second edition had another five print runs — 2006 (2x), 2007, 2008 and 2009. With My Knife was also published (print run, 42,000) by Scholastic in the United States in 1993 under the title Beyond The Open Door. With My Knife is the first novel in a trilogy, The Chronicles of Klarin. The other two novels are Dragonfox and The Red Dragon. After being out of print for several years, all three novels were republished by Rhiza Press in October 2018 in a single, trilogy volume titled The Chronicles of Klarin. The Chronicles of Klarin can be purchased through this website or though the publisher’s website, or ordered though your local bookshop. These quotes are taken from letters that children have sent to Andrew at various times. All these letters were sent to Andrew in an email from New Zealand school teacher in the second half of 2016. I am a teacher in a small rural school on the Coromandel Peninsula in New Zealand. There are 22 students in my class aged 8 and 9. This term I have been reading your trilogy of fantasy novels The Klarin Chronicles, to my class. They are totally captured by them and asked to write to you when they found your website. They want to show you the cardboard box portal we made. It is a very popular quiet place for reading and writing in class time. I have attached a photo. The children all wanted to write too so I have copied their letters below. Thank you for your inspiration and imagination. Your books are so interesting. The dragonfox is scary but the red dragon looks cool. We made a cardboard box with a triangle opening. Is the circle an opening too? Yours sincerely Courtney. I am a girl. You are very clever to wonder about the circle on the handle of Colyn’s knife. I have some thoughts about what will happen if/when Colyn cuts a circle. Maybe it will open another world … and maybe not! I loved your story With my Knife but The Red Dragon is even better. I like the way Yasni is bossy to Colyn. Yes, Yasni is pretty bossy, isn’t she? But she is also very nice, in her own way! When Mrs Gibson our teacher read the first book With My Knife I was impressed. I didn’t like it when story time was over because your books seemed so mysterious. The whole class made a box with a triangular door. We drew dragons and coloured them with pastels. I’m glad you feel my books seem “mysterious”. That’s sort of how I feel about them, too. Mrs Gibson sent me photographs of the box with the triangular door. I think the whole class did a splendid job on it! I love your stories. I think they are the best. I hope you are able to write way more stories about Colyn, Yasni and the dragons. My favourite book is The dragonfox. If there was a competition in the Olympics for the best story writer you would by far win a gold medal. What time of the day do you write your stories? I bet it is when your kids are in bed. I am glad you love my stories, and I hope that you could be the judge of them if there is ever an Olympics for books. And yes, I do do a lot of my writing when my kids are in bed—or at least, I used to, when they were little. Your books are amazing. They are the best. I hope you are going to write a book number 4. We made a portal to Klarin. I helped make it. We drew dragons and lots of the main stuff in the books. It looks really cool. Do your children give you some ideas? You are the best book writer ever. Love from Mila aged 8 nearly 9. It is very kind of you to say that I am “the best book writer ever”. I wish it were true! Did you draw one of the dragons on the portal? I really enjoyed The Chronicles of Klarin. My favourite one was Book 2, Dragonfox. My favourite character is Wayth because in Book 3 he gets married to Insay and Yasni gets a tear on her face. I feel really happy for Wayth. I hope you make a 4th book. I also love writing about and reading all sorts of books, like the Troll Attack and The Chest of Mysteries. We made Klarin with a freezer box like Colyn did. You are my favourite author. I am glad you like Wayth. I think he is great, too. It pleases me immensely to think that I am your favourite author! You say you love reading all sorts of books. Have you read The Lion, the Witch and the Wardrobe and the other 6 books of the Narnia Chronicles by C.S. Lewis? They are splendid! Do you write a book then send it around the world? Or does someone else do that for you? I really liked your stories. I don’t send my books around the world, but my publishers do. My job is to write them and the publisher’s job is to print them and sell them. Your books are fantastic. We read the first two books and are almost finished the 3rd one. I enjoyed listening to Mrs Gibson them to us. How did you come up with all the ideas? I am glad Mrs Gibson read my novels to you and I am glad you like listening to her read them. And, just between you and me, I think she must be an excellent teacher to choose such excellent books! Did you know that we’ve read all your books. Maybe could you write a fourth one please? Your books describe ever so well. Thank you for loving my books and thank you for telling me so. I would like to write a fourth book, but right now I don’t really have the time or the ideas to write it. I love all of your books. Mrs Gibson is reading them all to us. We are making the world of Klarin. I love the killing of the dragons. I kind of like the killing of the dragons, too. And I reckon they deserve it. I live in Hahei. It is in New Zealand. It is really nice here in the summer. There are more than one thousand people living here. I love all your books. Mrs Gibson is reading them to us. They are in our school library. Have a good time reading our letters. Are you going to write a fourth book? If you can, please send us a letter. You live in Hahei, New Zealand and I live in Perth, Western Australia. I reckon we are both pretty blessed. If I do write a fourth book to go with the other three in the Chronicles of Klarin, I will try to remember to write to Mrs Gibson to let her know about it. Your books are all so interesting and exciting because you never know what’s going to happen next. My favourite part in book 2 is about the dragon fox. 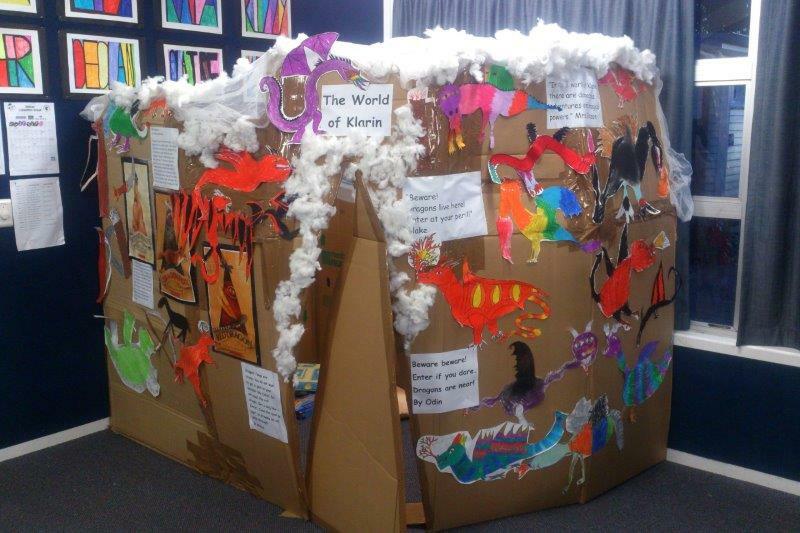 We even made a box like Colyn’s but we decorated it with dragons, knives, bolas unicorns and bow and arrows. You say that my books are “interesting and exciting because you never know what’s going to happen next.” Thank you. You might like to know that sometimes I didn’t know what was going to happen next myself, and I only found out when I began writing it. I go to Whenuakite School on the Coromandel Peninsula in New Zealand. You should keep us going with a fourth book. I really love all the gruesome bits and Kinzar is awesome. If I write another novel, I will try to put some more gruesome bits in it. And I agree, Kinzar is awesome! Do you have a dog? Your stories are the best. I love your books more than my games. Is there a 4th book? I am getting quite a fat head from all the kind things you and your classmates are saying about my books! If it gets any fatter, it will probably burst and then I will never be able to write a fourth book! Your books are awesome. I like how the knife is magical. I like how Colyn’s knife is magical, too. In fact, it was thinking about the knife being magical that gave me the idea for the first book, With My Knife. Mrs G read the series of With My Knife. Your books are fantastic. Where do you do your writing? My favourite part is when Colyn found the Kinrye at the very beginning. Thank you for your kind words about my books. I do my writing mostly at home, in my study or on my back veranda. Sometimes I sit in a café to write. And sometimes I go away to a farm to write. I like the part in the books when Colyn and Yasni were in the mountain Lairs. It was scary. Mrs Gibson does not like the dragon roaches. Thanks for writing the books I really love them. I don’t know why Mrs Gibson doesn’t like the dragonroaches. She must be a scaredy-cat! One of the parts I like best when Colyn and Yasni are in the mountain lairs is the hatching of the baby red dragon (the same dragon that causes so much trouble in the next book). When Mrs Gibson was reading With My Knife I was dying for her to read Dragon Fox. When she did I loved it. I am glad you loved Dragonfox. And I am glad you didn’t die while you were waiting for Mrs Gibson to read it when she was reading With My Knife! i loved this book so much it amazing book! Colyn finds a magic knife while digging in a field of potatoes. By peeling a potato, Colyn can turn it into stone but his dad does not believe him. By cutting a triangle in a potato with the magic knife he stares into a mysterious dragon’s eye. It is after his magic knife has created a live dog from a wooden carving that life becomes dangerous. The knife leads them to the otherworld and allows dragons into their world. By entering that magic world Colyn comes to understand what really happened to his mother. When you start reading you do not think this is a book about magic and mystery, but as you get further into the book you realise it is the complete opposite. The book is full of magic and mystery and you only understand it when you finish reading it. The characters are very well done and have a big impact on the story. Colyn is a boy who believes in what he sees and never stops trying to convince his dad of what he sees. Colyn is a strong character who never gives up. This fantasy novel would be suitable for 10 to 15 year olds. I enjoyed reading it and would give it an 8 out of 10 rating. This book is very scary. Colyn cut a piece of cardboard that let to another world. It may have to do with the strange knife he used to cut it. When he starts seeing the dragons coming he was to think of a wise plan. Andrew Lansdown did a great job with this book. BUY IT! When I read this book for the first time in 7th grade, I stopped reading books altogether. It wasn’t because the book was bad, it was because it was so good. I wanted a sequel, and they just never had it; thus, I never read for fun again until senior year, when I rediscovered the book. Great shape. Quick and easy shipment. This was one of my favorite books when I was younger and it got lost in transit when my parents moved. So glad to find it again. Colyn was digging potatoes with his father when he found the knife. It was buried quite deep and a large potato had grown around the blade, as if someone had stabbed the knife right through it. ‘Yours!’ cried Colyn, surprised and disappointed. ‘How do you know this is the one?’ Colyn asked. But he knew the answer. The handle was wood, richly brown, like jarrah, and had a circle etched on one side and a tapering triangle on the other. The blade was long, thin and slightly crescent-shaped. No one could forget a knife like that. ‘See how the blade looks like stone?’ said his father. The blade was almost black and had a dull sheen. There was not a spot of rust on it. And the handle was clean and smooth, as if it had been polished by constant use rather than lying lost in the soil for years. ‘I s’pose you’ll keep it now,’ said Colyn. ‘Well, I’m not going to chuck it away,’ his father said, putting the knife into one of the deep pockets of his overalls. Although he did not know it until that moment, Colyn had been wanting a knife of his own for a long time. ‘What will you do with it?’ he asked, trying not to sound sooky or mean. His father had begun digging again. He glanced up at Colyn and suddenly he realised what his son was feeling. He thrust the shovel into the dark loam and propped his right foot on it. Colyn could not remember his mother. She had died when he was barely three. He would be ten tomorrow, and he could not remember. Sometimes when his father spoke about her, his eyes would go distant and glassy, as if he were not behind them any more. But this time he blinked a bit and smiled at Colyn. He took the knife from his pocket and flicked the blade with his thumb. That night, as he sat in the lounge room by the fire with his father, Colyn began to carve a piece of wood. He had no idea what he wanted to make. He just started whittling. The knife was sharp and shaved the wood easily. ‘You’re making a mess,’ his father growled. Colyn did not look up. ‘I’ll sweep it after,’ he said. Before long, he realised that the wood had begun to take on a shape. But what? He stared at it intently, turning it around in his hands. It looked a bit like a dog. ‘Just what I’ve always wanted,’ he murmured. And he began to try, with all his might, to carve a dog. But the harder he tried, the less like a dog the piece of wood became. He threw the carving into the fire. As it landed on the coals, he thought he heard a dog bark way off in the distance. When Colyn woke, it was his birthday. But the first thing he thought of was his knife. He reached under his pillow and there it was, just as he had left it last night, just as he had dreamt. Colyn unwrapped his presents. One was a thousand-piece jigsaw puzzle; the other a leather football. ‘One for your brain and one for your body,’ his father said with a laugh. Because it was his birthday, Colyn did not have to work. After breakfast he kicked his football along the gravel road in front of the potato paddock. But he had no one to kick it back to him so he soon grew tired of it. He thought of his friends at school and wished, briefly, that the term holidays were ending rather than beginning. He left the ball by the road and wandered across the paddock. The loam was dry and soft, and little puffs of dust burst from beneath his boots as he walked. There was a place along the river where a tree had fallen into the water. It was Colyn’s special place. He climbed onto the trunk and walked out to where it sank beneath the surface. He sat down and stared at the water eddying past. In the backwater of the log a swarm of water beetles swirled crazily about each other. A blue dragonfly hovered over them. Colyn jabbed his knife into the trunk absentmindedly, prised off a lump of bark, and flicked it into the water. While watching the bark bob away on the current, he decided to carve his name. After a while he felt lonely, so he wandered over to see his father. Colyn shrugged. ‘Nothing to do,’ he said. ‘But it’s my birthday,’ Colyn protested, sitting down beside the sack his father was filling with newly-dug potatoes. He took a small potato from the sack and began to peel it. He had never peeled one with a knife before and he was surprised at how well he could do it. The potato seemed to shed its skin as the knife touched it. As the last patch of skin fell off, leaving it perfectly white, the potato seemed to change. He weighed it in his hand. It felt heavier. He bit it. It was hard, like a stone! ‘Go on, you scallywag!’ his father laughed, ruffling his hair. He took another potato and began to peel it while his father looked on. But this time the peel did not come away easily. When he had finished, he held it in his open palm, staring at it, but it did not change into a stone. His father unearthed several large potatoes. Colyn took one and walked back towards the river. He sat on the fallen tree beside his carved name and set to work with his knife. As the last bit of peel fell away, the potato became heavy and hard in his hand. He bit it and it hurt his teeth. He banged the log and it bruised the wood. ‘See, I wasn’t imagining!’ he said. an imprint of Scholastic Australia. 1992; rpt 1992, 1994, 1996, 2006 (2x), 2007, 2008. Click here to open a downloadable pdf of the first chapter of With My Knife.